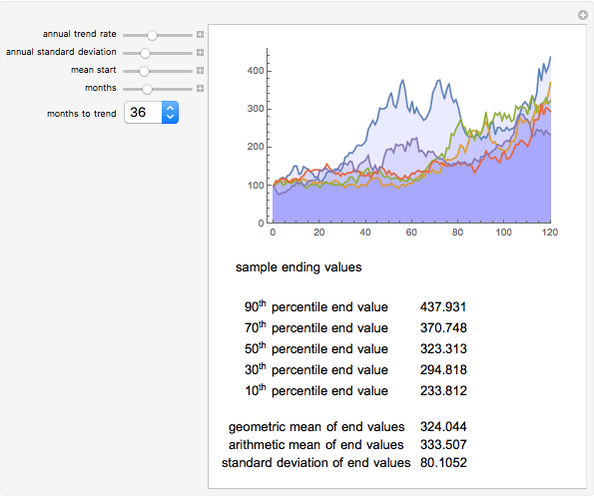 Many financial or economic processes can be modeled as mean-reverting random walks. Mean-reverting walks differ from simple diffusion by the addition of a central expectation, usually growing with time, and a restoring force that pulls subsequent values toward that expectation. The random term is lognormally distributed, and the initial value of the mean can be above or below the series start. The strength of the restoring force is given in terms of the time to return to the mean. The plot shows sample paths which result in the , , , , and percentiles in endpoint value, out of a larger sample. Rates are given in annual percentage terms, while the path lengths, mean reversion rate, and individual steps are given in months. The series always starts from an index level of 100. The central tendency "mean" can start above or below the index itself. The annual standard deviation is given for the random component of the process. In general, the actual measured standard deviation of the mean-reverting process will be less than this value, and can be substantially below it for fast relaxation times and high standard deviation. The random component of the process is lognormally distributed, so proportional changes higher or lower are equally likely, while absolute changes are skewed. The mean moves deterministically at the trend rate, and attracts subsequent terms in the series more strongly when the series is farther from that mean. The relaxation time parameter, months to trend, controls how strongly this term acts. 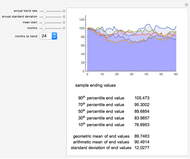 A relaxation time of infinity turns the process into a lognormal random walk with a trend rate. The level of the initial mean has no effect in that case. 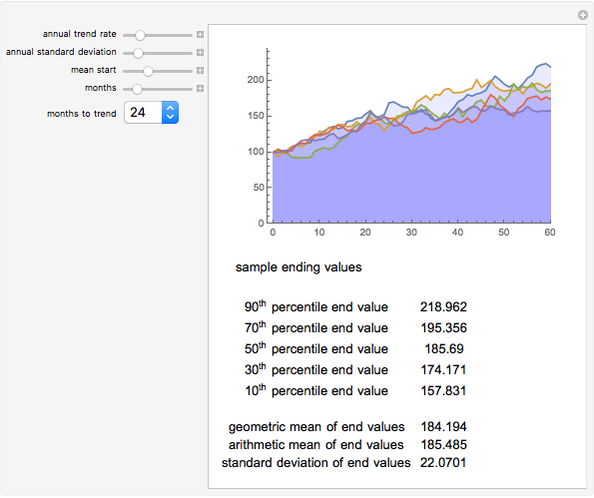 A sample of 100 runs is generated and ranked by ending value. 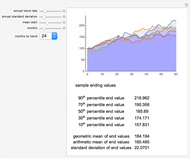 The series actually displayed are those at the , , , , and percentiles in this sample. Shading accumulates from the upper series to the lower, giving a rough idea of the probability of reaching various values. The table of values below the plot gives the ending values in the sample, for the same series plotted above. 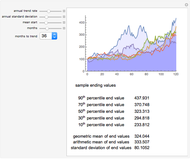 Means and standard deviation of the ending values are also given. Note that this standard deviation is not an annual figure, but the measured, absolute standard deviation of the ending values only, in index points. The default snapshot uses typical parameters for a broad stock index, assuming a modest initial overvaluation (mean lower than series start). The next snapshot uses typical parameters for a real estate series, assuming a slow rate of appreciation and a substantial initial overvaluation. The next snapshot uses the same parameters as the previous, but this time with an initial undervaluation. The next uses the typical stock index values again, this time starting from a modest undervaluation. 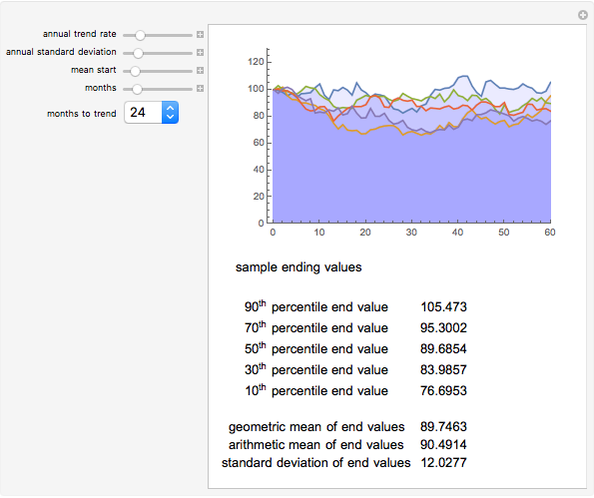 The last snapshot uses a high volatility, zero trend, and infinite relaxation time, thus giving a lognormal random walk with no trend or mean reversion. Note that on short time scales, lognormal random walks without any mean reversion term can be good models of securities prices. On longer time scales, mean reversion becomes more common, and it is also more common in macroeconomic series (e.g., corporate profits, anchored around a trend rate set by growth of the money supply). Jason Cawley "Mean-Reverting Random Walks"